We’ve been operating out of hours social media support for a year and it’s times like #nomakeupselfie that we can really see its value. Late on Tuesday evening, momentum was growing and people were starting to ask whether the campaign was ours. We tweeted to explain that it wasn’t, but that we loved the sentiment and that people could get involved in our work to beat cancer sooner by visiting our website. If we didn’t have an out of hours system in place, we wouldn’t have been able to see this coming and respond as quickly as we did. The next morning when we saw how many people had retweeted our tweet and the growing desire to support our work, we knew we had to do something. We quickly made a text to donate sign and posted our own #nomakeupselfie to Facebook, Twitter, Instagram and Google+. Within a few hours, tens of thousands of people had shared the post and we started to get an indication that the text to donate code was being used more and more. It was all hands on deck for our social media team as we tried to reply to as many people posting selfies as possible, answering questions and sharing the donate codes. This went on late into the evening, with replies coming from the CRUK account well past midnight. By this point, the text code was not only being shared by supporters on social media – news media was displaying it in news articles online and broadcasting it on TV and radio. We decided we needed to go out to our communities and thank the generous people around the country who had donated to fund our life saving research. Within a day, the UK public had raised over a million pounds for our research. Two days, in, we’d hit the £2million mark. At this point, there were a lot of shocked faces in the Cancer Research UK office. It was a genuine snowball effect and it started to go global, with people around the world contacting us directly to ask how they could donate from abroad. Although the campaign was social at its heart, we worked with other teams across the charity, including our direct giving and digital teams. It was a great example of how people around the organisation could quickly and enthusiastically respond to a really unexpected situation. 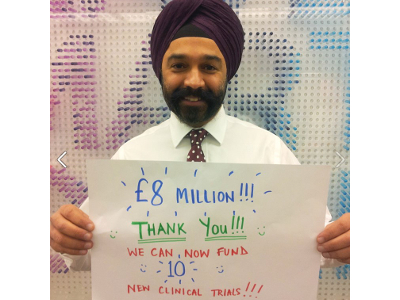 Almost a week later, we’ve hit £8 million and we can’t thank people enough for their support. The money raised will allow us to fund ten clinical trials, including trials that just last Tuesday we didn’t have money to support. This will allow us to get lifesaving treatments to patients faster.